The Gran Fiesta Tour Starring the Three Caballeros is one of our favorite boat rides in all of Disney World. It has an “its a small world” vibe to it as you travel around Mexico looking for Donald Duck, but in addition it is cool to see some of the old world styling of Mexico displayed for your amusement. We really like this attraction! 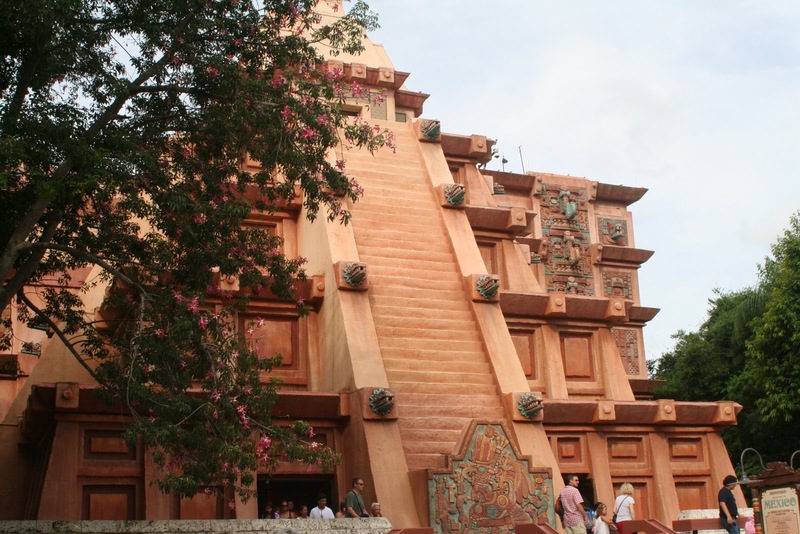 In addition to the attraction, we love the open air market feel that we get as we enter the center of the Aztec pyramid which serves as the home for Mexico. Also, there are a lot of cool shops that you can purchase gifts from inside. The lighting is subdued, so it is a nice place to take in a romantic dinner. Speaking of dinner, inside the pavilion is the San Angel Inn. We have never eaten at the Inn, primarily because I am the only true fan of Mexican food in our family. However, that isn’t a big drawback because even though we haven’t eaten there, we have certainly sampled the dishes just by the wonderful smells we get inside the market! Outside the Pavilion is La Hacienda de San Angel. This is a new casual dining restaurant wasn’t completed when we were there last, but is strategically placed by the Lagoon for great seating locations for the IllumiNations: Reflections of Earth fireworks show. A lot of people take a quick look in Mexico, but move past it fairly quickly. Mexico is a pavilion that will reach out and entice you, if you just take a moment to look around and absorb all that there is to see. 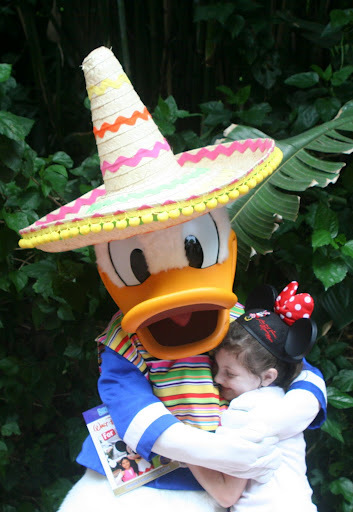 You may even find a great place for a cool picture with Donald Duck! This picture was taken in Mexico over on the side entrance to the pyramid. We were literally alone with Donald, and I was able to take over 12 pictures of Sophie and Donald and get his autograph!